I have met so many warm and wonderful people since I started blogging about three weeks ago. Many of you are photographers, and your work inspires me daily. I was very fortunate to come across an amazing photography blog about a week ago, when I saw one of my favorite birds in a really nice closeup shot. Mike Bizeau of that site was kind enough to give me permission to draw his photo. Isn’t it cool? 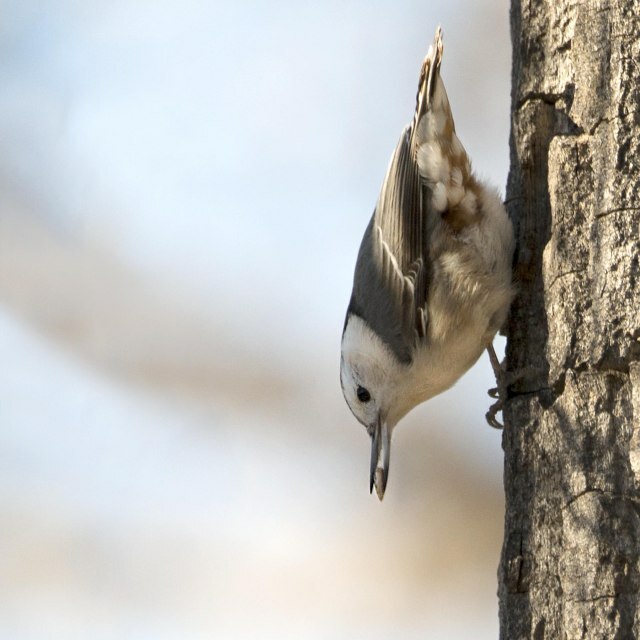 According to hub, the nuthatch is one of the few (maybe the only?) birds who can actually walk down a tree, while most birds walk up. They get all the bugs the other ones miss! The drawing actually took me almost an hour to do with a Polychromos Cool Grey V in my Strathmore 400 Series art journal. I need to learn how to sketch more and draw less before busy season sweeps me away with the tide! 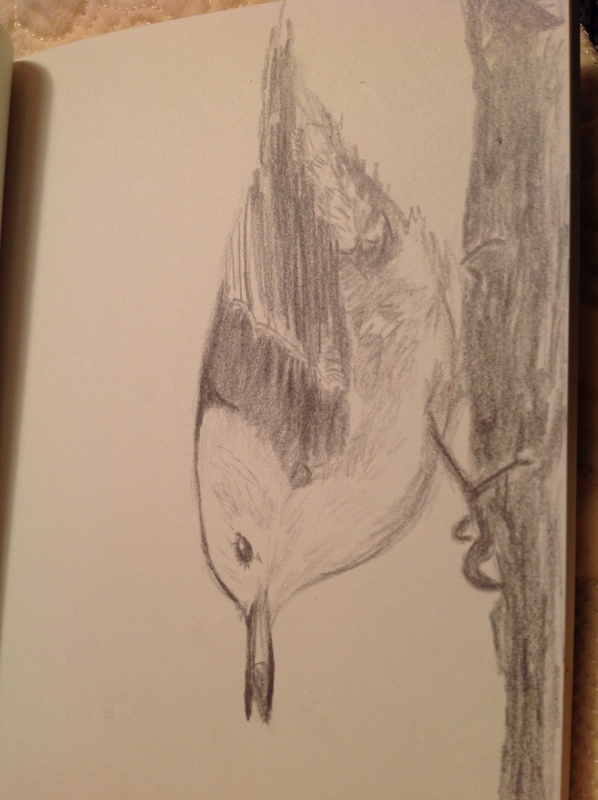 Looking forward to drawing another bird for you tomorrow. Think boys of summer, and you might just guess it! Good job! Do you only do birds? what else do you draw? Yes, it truly is. Thanks for visiting. Love your site! You’ve got amazing bird photos over there. Really looking forward to having the time to explore more. Thanks, Jodi! It made me smile as I was drawing. Curious…did you do what I would have done, and turned the photo sideways? Many people are freed from constraint by sketching things upside down, where they are forced to draw what they see without the filter of what they THINK they see. That sometimes helps me on proportions, but this little guy is making me dizzy! Love your work and your commitment. You are a new hero of mine! PS: While drawing my O post this afternoon, I was wondering how you are doing with your Polychromos? Are they as luscious as you had imagined? What a sweetie and a good drawing too. A very gentle suggestion could be to add some darks to make him pop. The photo has the trunk dark as it curves away from us and there’s a bit more dark on the bird. I hope you r feeling better. I admire your determination to keep drawing even when u dont feel well! I draw in bed half the time anyway, so it’s no worries, lol. Thanks again, Rachel, and I think that’s a terrific suggestion. Anytime you see something I could do to improve, please speak up. This whole thing for me is about improvement, so your comments are much appreciated. Ok will do. It is just my opinion, but a fresh set of eyes can see what we miss because we are too close to it. No doubt! My husband helps a lot. He is not an artist (although he could be if he wanted to be, I think), but he notices what’s awry when I know something’s wrong, but can’t put my finger on what. That’s an invaluable skill, but sometimes walking away, or even looking at something upside down does the trick.